This is a better release of the serial than most, using 2 discs instead of one for better picture/sound quality. Zorro's Black Whip (1944 Serial): The classic film serial "Zorro's Black Whip" introduces us to a female version of Zorro. The only reference to Zorro ever made in this film is the title itself. She is just called "Black Whip". It is set in America in the late 1800s. She's got a pretty flashy, Zorro-like costume. It's amazing what she can do. 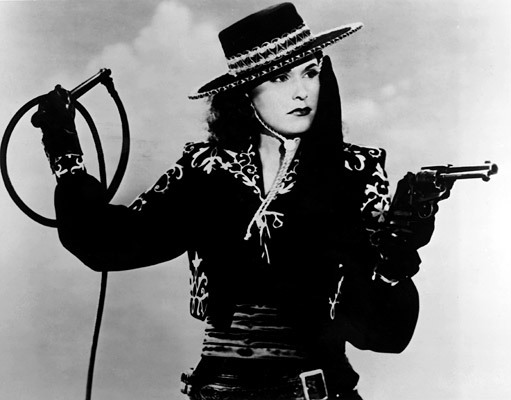 She knows how to use a bullwhip and how to shoot. Out of costume, she's a completely different person. She's pretty, polite, and very competent. Of course, this movie was made in the 1940s so you have a lot of that condescending "this job is too dangerous for girls" attitude from the male roles. This movie actually goes against that theory, which was dangerous ground for that time. This is another ground-breaking female role and although Linda Stirling played the main character, she did not get top billing. Linda got second billing under the male lead who spent most of his time unconscious and waiting for Black Whip to rescue him. Go figure. The first time a female really got notable top-billing in a western was Gail Davis in the "Annie Oakley" TV series in 1954. Linda Stirling as the Black Whip...unmasked! Publicity photo. CHECK OUT THE PBDEN CHANNEL ON YOUTUBE FOR THIS AND OTHER GREAT VIDEOS!